NSA recognizes that operational, economic, environmental, public, and social impacts are all integrally linked to the future mission – and therefore, maintains sustainability and environmental compliance programs to protect the environment, reduce our environmental footprint, and integrate sustainable practices into the natural and built environments. 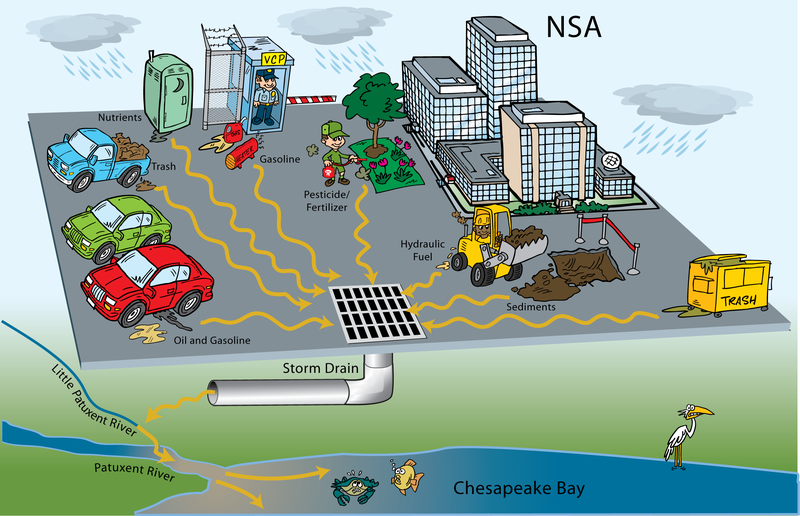 NSA headquarters is located within the Chesapeake Bay watershed and is covered under a Maryland Department of the Environment issued Phase II Municipal Separate Storm Sewer System (MS4) Permit. Management of operations which can impact stormwater and protection of the quality of stormwater is a priority to NSA. NSA maintains sustainability and environmental compliance programs to protect the environment, reduce NSA's environmental footprint, and integrate sustainable practices into the natural and built environments. NSA strives to operate in this manner to fulfill our compliance obligations and to demonstrate proactive environmental stewardship to our employees, our customers, and the communities where we operate. NSA recognizes that operational, economic, environmental, public, and social impacts are all integrally linked to the future mission. Meeting the commitment to actively manage these impacts is a primary senior management objective – as well as the individual and collective responsibility of all NSA employees worldwide. While meeting fundamental obligations to the nation, NSA will strive for continuous improvement in mission sustainment and optimal environmental stewardship. NSA maintains a comprehensive Environmental Management System (EMS) across all of our missions, activities, and functions. An EMS is a globally recognized management approach based on a cycle of continual planning, implementing, reviewing, and improving the processes and actions that an organization undertakes to meet its mission-related sustainability and environmental goals. Read our Environmental Management System Policy Statement, endorsed by the Director of NSA. NSA's headquarters is located within the Chesapeake Bay watershed, which is an estuary of immense importance for the environment as well as the millions of people who live, work, and play in the region. The Chesapeake Bay watershed includes land from New York to Virginia, and includes 50 major rivers and streams and the creeks that feed those rivers and streams. All of our day-to-day activities directly impact the health of the Bay. As a result, stormwater management and protection of the quality of stormwater have been identified as a goal for continual improvement by the NSA¹. What is stormwater? Stormwater is runoff water from rain or melting snow that flows across the landscape. Runoff flows off of rooftops, paved areas, bare soil, and lawns. Runoff gathers in increasingly large amounts (from puddles, to ditches, to creeks and rivers) until it ultimately flows into the Bay and ocean. On its journey from puddle to ocean, stormwater picks up and transports many of the pollutants it encounters. These pollutants include dirt, pet wastes, pesticides, fertilizers, automobile fluids (such as oil, gasoline, and antifreeze), deicing products, yard wastes, cigarette butts, and litter, just to name a few. By carrying all these different kinds of pollution into our waterways, stormwater itself becomes a water pollutant. The campus of the NSA has been referred to by some as a “Concrete Jungle” due to the volume of parking lots and paved and impervious surfaces. With every significant rain event, thousands of gallons of stormwater wash across our parking lots into storm drains that lead directly into the Little Patuxent watershed and ultimately into the Chesapeake Bay. It is very important that as individuals, we act as good stewards of the environment, working to ensure that we keep pollutants from entering stormwater runoff. The NSA is working to install measures to restore our landscape to a more natural state. The primary pollutants impacting stormwater at NSA are gas, oils, grease, nutrients from fertilizer, and sediment from erosion. In addition, the temperature and velocity at which stormwater enters waterways can cause a harmful impact. Oils, gas, and grease are deposited on the parking lots from leaking automobiles or they can be spilled by fuel operations such as the re-filling of gas-powered equipment. Fertilizers are applied campus wide to keep trees and grass healthy, but spills on sidewalks can end up in stormwater. Soil erosion from deforested and/or construction areas is our greatest potential pollution mechanism and one of our greatest areas of concern. NSA is covered under a Phase II Municipal Separate Storm Sewer System (MS4) Permit from Maryland Department of the Environment (MDE). In accordance with EPA guidelines for the National Pollutant Discharge Elimination System (NPDES), this permit allows federal facilities to discharge stormwater to waters of the United States, as long as they design and implement several Best Management Practices (BMPs) which will mitigate the harmful effects of pollutants in runoff. Examples of BMPs include the restoration and/or treatment of impervious surfaces through the installation of Environmental Site or Low Impact Design structures (ESD or LID); the implementation of erosion and sediment control plans and installation of erosion and sediment control structures at construction sites; training and awareness programs including the MDE erosion and sediment control “Responsible Person” certification training; and on-going inspections and maintenance. A copy of the permit may be found on the MDE NPDES Municipal Separate Storm Sewer System Permits webpage. ¹ Chesapeake Bay Foundation, www.cbf.org, October 13, 2016.